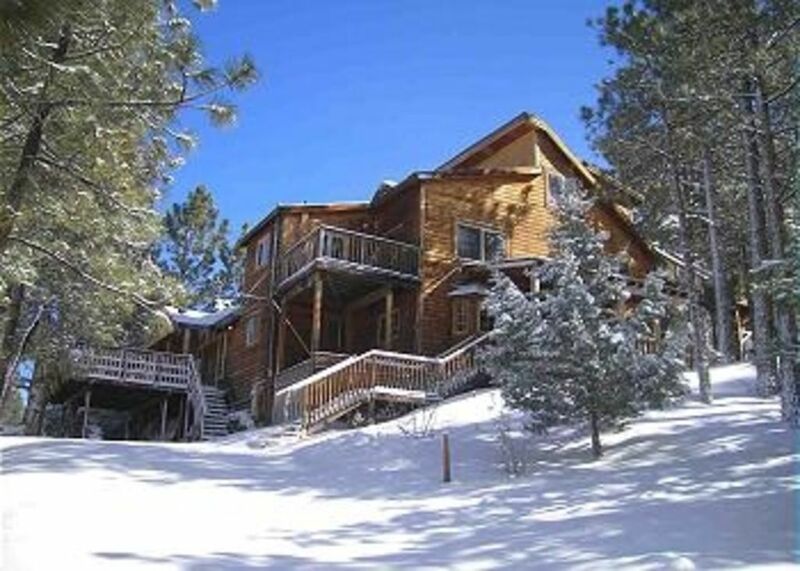 Large and Cozy Lodge/Cabin in Big Bear- Tons of Amenities! This rustic get-away offers something for everyone! Lots of bedrooms with balconies for privacy, large common areas for hanging out and playing games, huge kitchen with two stoves and double-oven for party-style cooking, floor-to-ceiling rock fireplace to enjoy while lounging in the living room, and another wood-burning fireplace near the huge flat-panel TV and pool table in the game room. This place is great for one to four families, or groups of all sizes. The 4-Season Resort area is great for skiing, hiking, boating, etc. and is a quick trip from LA. multi zoned for additional comfort. Bath towels only. Please bring your own beach towels. Enough to feed over 30 people. 42in. flat screen in game room. Most bedrooms have TVs and cable. 8 tvs with cable hookups. Round poker table for 6 people. (6) Four of the bedrooms have private balconies. Additional deck off the loft. Two decks on the main floor for entertaining. From the instructions to accommodations, it was no frills. There were no outrageous surprises. Just like as mentioned from a previous review, the hot water was short supplied. But we got by. Bathrooms and kitchen were ample. Great house for 20! This place was cozy and had more than enough space for our large party of 19! The two 4 stove burners and stacked ovens were convenient to make all our meals within an hr. The kitchen had plenty of space for at least 4 people to cook all at once which made the kitchen a nice social area. There were plenty of board games and a pool table to keep us all busy and enjoy the cabin. The only complaint was the heater on the second floor; some rooms had heat and others didn't. I would suggest turning on the heater in the individual bathrooms throughout the night. Also, we were unable to use the hot tub as there was not enough hot water to fill it. Mike was great to work with. He answered all my questions in a timely manner and was very accommodating. We had a full house and there was plenty of room for privacy and enough room for the whole group to be in the same space. Lots of bathrooms! We did run out of hot water, when multiple people showered, but it heated back up pretty quickly. We loved that the hot tub was indoors. The kitchen had a lot of pots/pans/plates/utensils etc. Overall, everyone enjoyed the stay. kapil m.Where do you live? There are lots of bedrooms, space is great and layout is very good. Pool table and foosball table are excellent. We did run into problems with the hot tub which did not have a functioning heater. Though I notified the owner, responses were delayed, and no one came to fix it. It was very disappointing for all the kids (we were 5 families) on a Labor Day trip. Property is old and some appliances didn't work well for us (washer/dryer). Our large group did enjoy our stay, appreciated many sitting areas, and proximity to the lake. We had four families....20 people including the kids.....and their was plenty of room. The kids never even got on their devices to play video games! We stayed over Presidents' Weekend with a total of five families, kids ranging from toddler to teenager. The home has spacious common areas - kitchen, living room, dining. Kitchen was well-stocked with pots, dishes and utensils. Pool table was popular with the kids. The slope just outside the home was great for sledding on the snowy morning. The location was convenient to Snow Summit, Big Bear Snow Play, supermarket and restaurants. We had a few issues during our stay - water leaks and broken appliances. Unfortunately, most of the issues were irreparable during our stay, but Mike was very responsive and seems like a very responsible property owner. I trust he will make the necessary repairs. Overall, would recommend for large groups. Rates are subject to change until reservation is confirmed. Weekend stays require a Friday night and Saturday night stay.